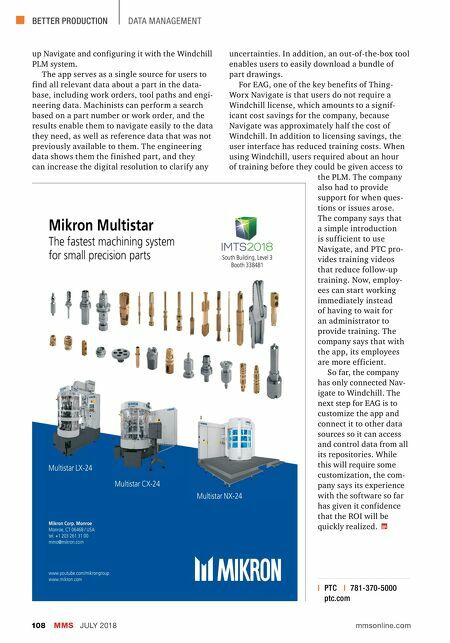 BETTER PRODUCTION MMS JULY 2018 108 mmsonline.com DATA MANAGEMENT Mikron Multistar The fastest machining system for small precision parts Mikron Corp. Monroe Monroe, CT 06468 / USA tel. +1 203 261 31 00 mmo@mikron.com www.youtube.com/mikrongroup www.mikron.com Multistar CX-24 Multistar NX-24 Multistar LX-24 South Building, Level 3 Booth 338481 | PTC | 781-370-5000 ptc.com up Navigate and configuring it with the Windchill PLM system. The app ser ves as a single source for users to find all relevant data about a part in the data- base, including work orders, tool paths and engi- neering data. 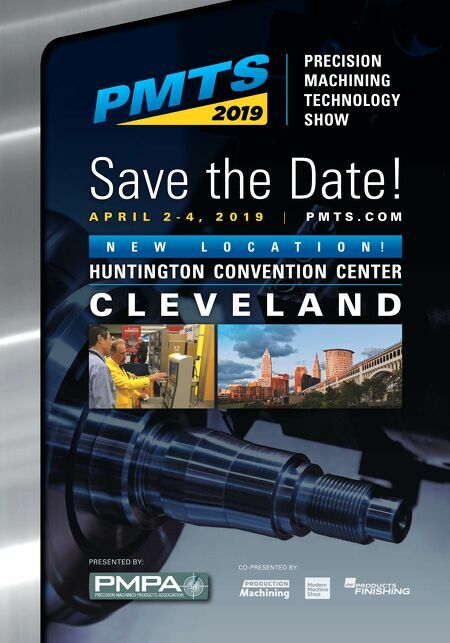 Machinists can perform a search based on a part number or work order, and the results enable them to navigate easily to the data they need, as well as reference data that was not previously available to them. The engineering data shows them the finished part, and they can increase the digital resolution to clarify any uncertainties. In addition, an out-of-the-box tool enables users to easily download a bundle of part drawings. For EAG, one of the key benefits of Thing- Worx Navigate is that users do not require a Windchill license, which amounts to a signif- icant cost savings for the company, because Navigate was approximately half the cost of Windchill. In addition to licensing savings, the user interface has reduced training costs. When using Windchill, users required about an hour of training before they could be given access to the PLM. The company also had to provide support for when ques- tions or issues arose. The company says that a simple introduction is sufficient to use Navigate, and PTC pro- vides training videos that reduce follow-up training. Now, employ- ees can start working immediately instead of having to wait for an administrator to provide training. The company says that with the app, its employees are more efficient. So far, the company has only connected Nav- igate to Windchill. The next step for EAG is to customize the app and connect it to other data sources so it can access and control data from all its repositories. While this will require some customization, the com- pany says its experience with the software so far has given it confidence that the ROI will be quickly realized.